The Alexandra Lake Fly – from the 1893 Orvis Display in the American Museum of Fly Fishing in Manchester, Vermont. This fly is 120 years old. The hook size is approximately a 1/0. Note the whole light brown mottled turkey quill wing under the peacock sword. This previously unknown full quill wing is just one tidbit of actual fly pattern component discovery that I have unearthed during my research for my book, Favorite Fishing Flies – 1892. The turkey wing on the Alexandra has seemingly been missed from most, if not all fly pattern sources where this pattern was published for over one-hundred years. 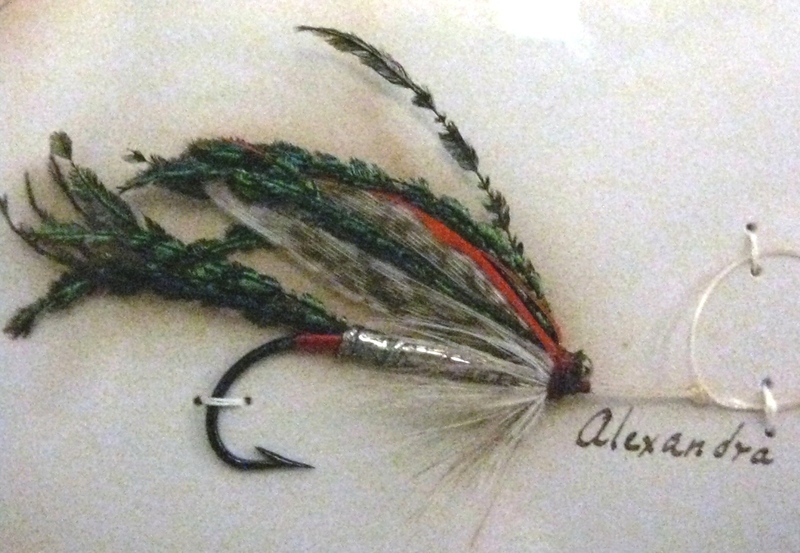 The Alexandra is pattern number thirty-six of the Lake Flies in Mary Orvis Marbury’s 1892 book, Favorite Flies and Their Histories. Leonard’s own line drawing, Figure 7, p. 37 in Flies, shows a contradictory labeling of “tip” and “tag.” The fly on Figure 7 shows a two-part tag and no tip, even though the front floss portion of the tag is labeled as the “tip.” I am going to go with his written definition, as it makes more sense, even though this is one of the rare occasions that I choose to place more trust in what I read rather than what I can see. I love J. Edson Leonard’s book, Flies, don’t get me wrong on that. It is very detailed and covers a ton of material. Yet there are mistakes in his fly pattern recipes taken from Mary Orvis Marbury’s book plates, that I have discovered according my visual inspection and study of the actual flies that were used for the painted color plates in Marbury’s Favorite Flies. I listed the tag, tip, and tail on Leonard’s recipe according to his written definition of the material placement, though this contradicts further with the Marbury / Orvis published pattern, from which Leonard reputedly took his recipe for the Alexandra. “The pattern was invented by Doctor Hobbs a number of years ago, and it came into great favor with English fishermen; indeed, it was believed to be so taking that its use was forbidden on some streams. The favorite method was to allow the line to run with the current, and then draw it back up stream by short, sudden jerks that opened and closed the hackles, giving a glimpse of the bright, silvery body.” (Note Leonard’s body of gray floss). My family and friends have found the Alexandra to be a particularly effective pattern for brook trout and landlocked salmon in Maine. My niece Emily also had success one year right over the hill from my home on Pennsylvania’s Lycoming Creek, trailing an Alexandra behind a Wooly Bugger. On that Memorial Day afternoon in 2006, Emily landed seventeen trout, and just three fish took the bugger. The remaining thirteen trout were taken on the Alexandra, Yellow Sally, and Parmacheene Belle. Guess nobody told those browns and rainbows she caught that they weren’t supposed to eat classic brook trout flies. This writing is a sampling of the fly pattern information that my research has turned up in my work on writing my first book, Favorite Fishing Flies – 1892. The book is in the final phase of completion. This entry was posted in Fly Pattern Recipes, New Book, Wet Fly Photos and tagged Alexandra, American Museum of Fly Fishing, Classic Wet Flies, Favorite Fishing Flies - 1892, Favorite Flies and Their Histories, Flies, J. Edson Leonard, Lycoming Creek, Mary Orvis Marbury, Parmacheene Belle, Tag, Tip, Wooly Bugger, Yellow Sally. There was gibberish there when I first published the post, but I edited it and deleted it right away. It’s not there on my computer and should be gone. Once in a great while that happens, I don’t know why. Look forward to seeing your book. Any idea of when it will be published? Who is a good source for seal substitute? Thank you for your interest and comment! I do not know how long the editing and printing process will take, once the manuscript is sent to the publisher, which will hopefully be in a couple months. As far as a seal substitute, every fly tier has been looking for that for ages. 😉 However, mohair, isn’t too bad, and if perhaps spiked with some of Wapsi’s Dubbing Enhancer – that would be even better. The Dubbing Enhancer is made of tri-lobal fibers of different diameters and lengths, and has a sheen to it. It works best when another fur is used with it, serving as a binding agent. Thanks again for your comment! Don, I have used the Alexandra to great effect on my fav UK Reservoir, Ravensthorpe. Appreciate the info on the Hardy Demon Streamer. Is that pattern in Veniard’s book by chance? I have a copy but am too lazy to get it and start looking, plus I have fly orders to finish and get in the mail this morning before noon. 😉 The info on Dr. Hoobs and the Alexandra was presented in Marbury’s book. The Alexandra, along with other patterns having silver tinsel bodies, the Black and Silver, Split Ibis, Silver Doctor, and my Red Squirrel Picket Pin, have been extremely effective in Maine for a number of years. Thanks for your comment, and for the link to the Hardy Demon! I initially saw the pattern on a video by Joe Cornwall from flyfishohio.com. There is a link from the page I gave you the link. BTW: I met Grahame Maisey today, had a really good chat regarding old hooks and i purchased some Carrie Stevens streamer hooks and some Harrison Bartleet hooks, a style that he says is what many of the MOM Bass flies were tied on. I was referring to Veniard’s Fly Dresser’s Guide, 1950. The pattern may not be that old. Nice that you got to meet Grahame! He’s a good guy! Glad you had a chance to buy hooks! Thanks for your comment! Great write up here Donnie. Love all the history, and facts about how originals were made. Thanks for this. I enjoyed it immensely. Thank you for your kind words on this fly-history lesson. I love this stuff, glad you and others do as well! Thanks again for your comment! One of the few flies I actually tie adequately and a standard in my box. I had not heard of the turkey wing addition. I use this fly when I am teaching cultural history as a perfect example of the industrial revolution and the impacts of world trade. Snelled hooks, India for the Peacock feathers, silver tinsel from the growing market in luxury goods, the rise of sport fishing. Students enjoy it. I’ll also add the opinion of a heretic. It makes a much better bass fly as it drives their little brains insane and they hit it hard. PS: If anyone can help, I have some references to the fly being illegal in Scotland for a number of years as they considered it cheating. If anyone anywhere could find a copy of the actual law I would be a very very happy history teacher. Thanks for your input here on the Alexandra. Actually, I did not know about the turkey in the wing either, until I was able to inspect and photograph the original flies from the Marbury book plates, and also the pattern from the 1893 Orvis Display at the Museum in Manchester, Vermont. I don’t believe any pattern recipe listing anywhere for the Alexandra included the turkey in the wing. It is not visible on the painted fly on the Color Plate E in Mary’s book. I just checked and there is one small, tiny, almost obscure bit of the tip of the turkey quill wing painted in the image, but I can see that it is turkey only because I made the discovery from checking the photos I took. Not knowing that, one would assume the wing on the Alexandra, pattern No. 36 in Marbury’s book, is all peacock sword. I had heard and read that the Alexandra was banned from fishing competitions because of it killing effectiveness. I was told the same is true for the Zulu wet fly pattern as well. I like history, and I like your teaching of this fly for the reasons you stated. Thanks for your comment and input!